To many people, the internet is about speed, and any delay in page load speeds can be detrimental to an ad campaign. For many years, consumers were fairly forgiving of slower-loading mobile sites because of device power and mobile internet speeds, but in 2018, consumers expect more from mobile. A report cited by Google found that a one-second delay in mobile page load can decrease conversions up to 20 percent. Google recently announced some changes to AdWords to help deliver the fastest mobile experience for ads. Though the effect is usually small, using multiple ad analytics tools on a website can make the site load more slowly. You may have noticed this when browsing a site on a desktop computer. You can normally see the URLs the site is communicating with for a second as the site loads. Adding more trackers compounds the problem, so Google introduced a system called parallel tracking to prevent sites from loading slower. Besides being a very useful feature, it will soon become mandatory for AdWords. Starting October 30, 2018, parallel tracking will be required for all AdWords accounts. To make sure your click monitoring system is setup to work with parallel tracking, the feature can be optionally switched on and tested now. For the most part, it’s safe to assume that the majority click monitoring systems will make the changes necessary to be compatible with parallel tracking by October 30th. This requires a lot of technical fixes that if not done, will affect the accuracy of reports, though it shouldn’t affect what the visitor sees when they visit a site. To illustrate, every part of the redirect chain must have an HTTPS server or the click won’t register on the third-party tracking software. 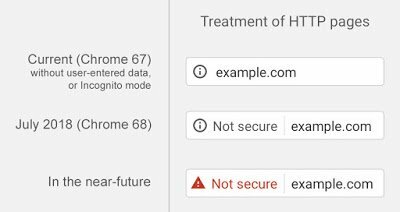 Speaking of HTTPS, Google also announced several tweaks to the way landing pages from search are handled. Beginning June 11th, AdWords will enable HTTP Search ad clicks to automatically be redirected to HTTPS when possible. To prevent the switch to HTTPS from affecting reports, Google launched an ad version history tool which allows advertisers to update the landing page URLs from HTTP to HTTPS without resetting all of their performance statistics. Also, in a few weeks, Google will start to warn advertisers in AdWords when they’re using a less secure HTTP addresses for landing pages. They also plan on adding a red warning label in the URL bar for HTTP sites. This makes HTTP URLs a bad pages to land potential customers on, since (depending on the browser they use) they may see a warning in red that the site is not secure. Since ad campaigns are already at a disadvantage when it comes to gaining consumer trust, it’s worth the cost to upgrade to a secure HTTPS server if you intend to sell products or get personal information from people who visit the site through an ad. To learn more about recent update and changes to Google, read this article about an update to the Google My Business dashboard that will help agencies manage multiple locations.